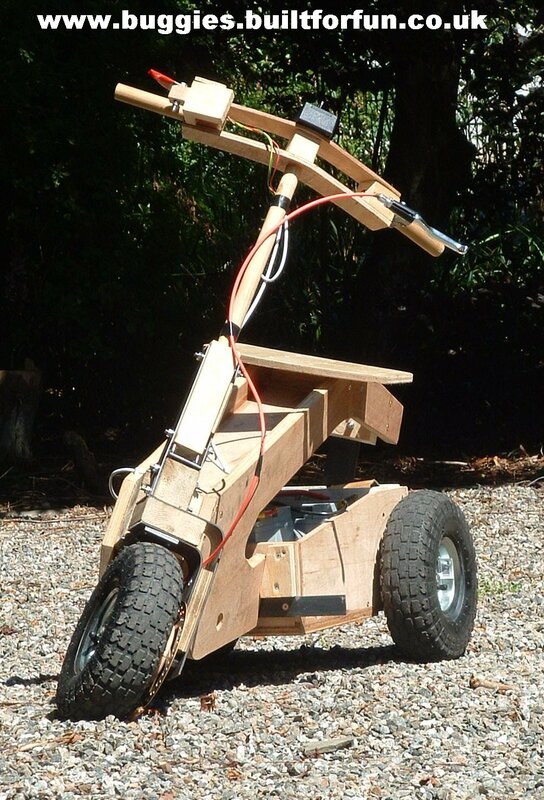 Plans for DIY electric tilting scooter. Because of its tilting action this 3-wheeler Scooter design is structurally a bit more complicated than the Trike on the site. It's a more interesting ride though as it has to be balanced much in the same way as a bike. It's still “buildable” by competent DIY ers and home-builders using non-specialised tools and materials. Other than the tilting structure it uses the same drive and steering elements as the Trike so much of the description given below is the same. The scooter has a mainly timber “glued and screwed” construction, a rear double reduction drive gearbox, 10” pneumatic wheels and a front disc brake. Several important strength components are made of steel and throughout use is made of standard stock engineering components such as bearings, bright steel bar, gears, sprockets etc. 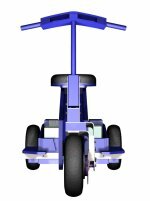 It's laden center of gravity is a bit forward of the rear wheels which gives a balance between weight over the rear wheels for traction and download at the front for steering and braking. The scooter is driven by either a single or double motor gear box - both of which use 250W electric scooter motors which are commonly available in both here in the UK and in the US. The single motor scooter is the simpler of the two and has fewer parts but the simplicity and lower cost has the obvious consequence of lower power output (250W). There is also a traction related drawback - to keep the high levels of manoeuvrability offered by the single front steering wheel I found it was best with the single motor drive to drive only one of the rear wheels and leave the other free-wheeling; the alternative was to drive both rear wheels through a fixed rear axle – an arrangement I experimented with but found, because there is no differential action, that the steering effectiveness was badly compromised. 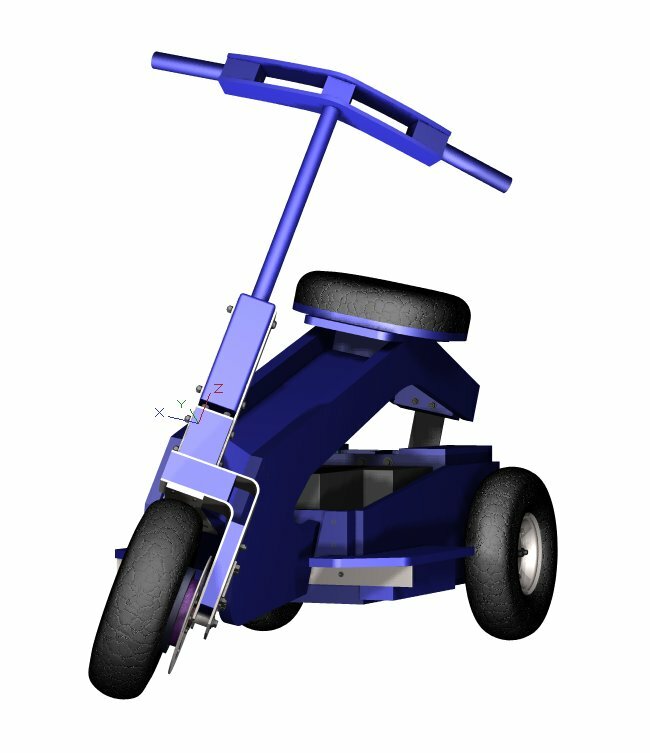 I found that the traction from one driven wheel is easily sufficient to drive the scooter on reasonably good drives surfaces – see the movie clips below. 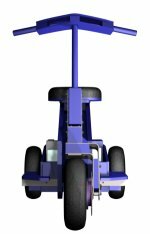 The turning problems are resolved with the double motor driven option - each of the rear wheels is driven by its own motor, each develops traction and the speed/torque characteristics of the motors ensures effective differential action when they are wired in parallel to the same controller. A further key advantage of the double motor drive is the higher power output (500W). In some vehicles this could be exploited though a higher speed transmission to the wheels but with this vehicle it's probably better to use the power to increase the available wheel drive torque and allow the Scooter to be used on poorer surfaces found in many gardens – hard gravel paths, mown grass lawns etc. 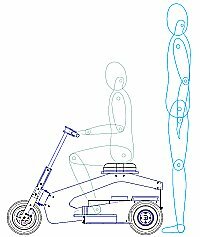 These characteristics and the 10” wheels and relatively low ground clearance (about 3.5”) mean the Scooter isn't really an off-roader and is best suited for good (hard and flat) drive surfaces. The double motor drive though extends the capability to hard gravel and cut grass lawns and modest hill climbing. The gearbox is a key part of the design and is described in more detail here. The boxes are home-built too and are efficient, reversible, back-driveable and allow choice in the overall reduction ratio and hence output speed – watch this though, using too high an output speed simply results in over torqued, over heated motors which won't last. We have found that gearing to produce a top speed of about 7 to 8 mph is probably the maximum for use on good drive surfaces and less than this for poorer higher drag surfaces. Clearly the higher power version does better with the heavier riders and poorer surfaces. An interesting exercise is to check the specs for 250W and 500W electric scooters you can buy – see how they compare. The electrical system is standard for small electric vehicles ie motor(s), motor controller, batteries and speed/reverse/ignition controls. 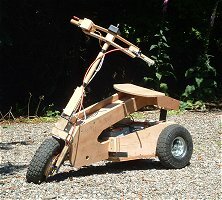 The controller used on this single motor scooter is the 24V 40 Amp Vortex controller from 4QD which has worked well – the 75Amp version is probably needed for the double motor drive. Room for two 12 V 38AmpH deep cycle batteries wired in series is built-in to the structure and these give a continuous running time between charges of about 2 hours for the single motor drive which isn't bad. For the same driving conditions the range for the double motor version will be a bit less – though not half, the power consumed depends mainly on vehicle duty and weight not number of motors. Running time reduces with use on harder driving surfaces. All in all - an interesting little run-about. Copyright � 2006-2010 BFF Design Ltd All Rights Reserved.